Feed a family of four in just 10 minutes with a Tasty Tuna BLT. 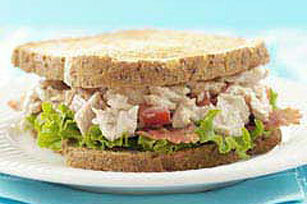 Our tuna BLT, with creamy MIRACLE WHIP, gives tradition a delicious seafood twist. Mix tuna, dressing and tomatoes. Cover 4 of the toast slices with lettuce and bacon; top with tuna mixture and remaining toast slices. Prepare tuna salad as directed. Crumble the bacon or use 1/4 cup OSCAR MAYER Real Bacon Recipe Pieces. Stir into the tuna salad for a lunch on-the-go. Serve with RITZ Crackers.